Acromioclavicular separation refers to abnormal widening of the acromioclavicular joint. The injury is caused by direct trauma to the shoulder. The principal ligament to consider is the coracoclavicular ligament with a lesser role played by the acromioclavicular ligament. Ligamentous injury to the acromioclavicular joint is classified by Grade I, II, and III injuries. Grade I injury is termed sprain. Radiographs of both shoulders are acquired with stress views to see if there is abnormal widening of the acromioclavicular space (normal < 4 mm). Grade II injuries are termed subluxations and the acromioclavicular ligament is either severely torn or completely torn. The coracoacromial ligament remains intact meaning that only a small amount of superior migration of the clavicle is present when imaged with stress. Grade III injuries indicate that both the coracoclavicular and acromioclaviclar ligaments are torn with abnormal widening of the coracoclavicular space and superior migration of the distal clavicle relative to the acromion. 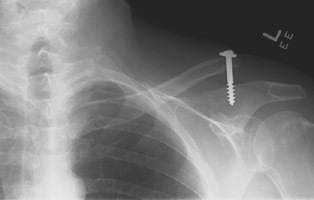 A AP radiograph of the left clavicle. There is grade III acromioclavicular joint separation. The screw was placed previously in an effort to prevent this injury.